Acupuncture is a treatment based on Traditional Chinese Medicine (TCM), a system of healing that dates back thousands of years. TCM is based on the belief that a type of life force or vital energy, known as Qi, flows through channels in the body called meridians. Each meridian connects to one specific organ, or group of organs, that governs particular bodily functions. The Qi depends on a balance of the two opposing energies of yin and yang. Illness results when too little or too much Qi exists in a meridian, or the Qi stagnates, or is blocked. 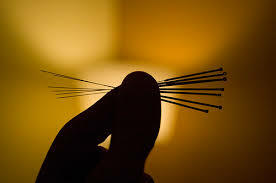 Stimulating certain points with fine needles can balance and restore the flow of Qi. Modern researchers have found that the acupuncture points correspond to the skin that has less electrical resistance than other skin areas. There is some evidence that stimulation of the skin can affect internal organs by means of nerve reflex pathways (autonomic nervous system). One theory is that acupuncture stimulates the release of natural pain-relieving chemicals called endorphins. Another theory is that it stimulates the pituitary gland, which in turn stimulates the adrenal gland to release anti-inflammatory chemicals. The cost of the therapy varies depending on the type of visit. The average cost for initial visits are between $75.00 and $150.00, and return visits are between $50.00 and $80.00 for self-pay patients. All automobile insurance companies cover acupuncture for the injuries caused by a motor vehicle accident. A few insurance companies cover acupuncture within narrowly defined parameters. Please check with your insurance company first to find out if acupuncture might be covered or contact us and we will be more than glad to assist you to find out your acupuncture benefit. Please feel free to contact us if you have any further questions regarding your treatment, and/or if we can assist you any further. Thank you.